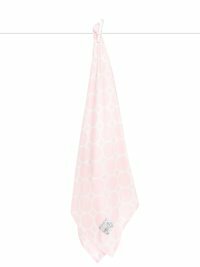 Surround baby in featherlight comfort with our chic Airie™ Promenade Swaddle Blanket. Our luxuriously soft jersey performance fabric is modeled after high quality workout fabrics and is easy to pack-and-go. Airie™ provides superior breathability, is hypoallergenic, and regulates temperature with moisture wicking properties. Use this versatile blanket as a sunshade for strolling, a quick cover for nursing, or a secure swaddle for baby. Airie™ has plenty of give, making it a dream, not only for baby, but for swaddle-challenged parents too! I notice that this swaddle only had one review and it deserves many more! This is the only swaddle that worked (out of about 10 that we’ve tried). Ignore the price. When you use it every night you’ll be coming back for more, like me. It’s very stretchy so baby doesn’t feel too constricted and it’s easy to stretch on and off her shoulders and arms. This functionality is key for us. It’s also huge so you can double it in some areas for extra warmth. 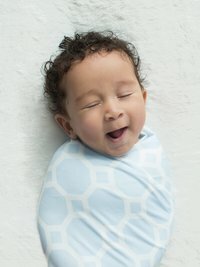 Skip the 3-packs from other brands and buy this swaddle! THANK YOU FOR EXISTING!! This is the only blanket I've been able to properly swaddle my son with. It's nice and stretchy so it's way easier to work with than the muslin swaddles you usually see.